With a population of only five million people, it’s staggering to learn that there are more than two million saunas in Finland. That’s an average of one per household. Many Finnish websites state that the sauna can only be truly enjoyed in Finland, its birthplace. 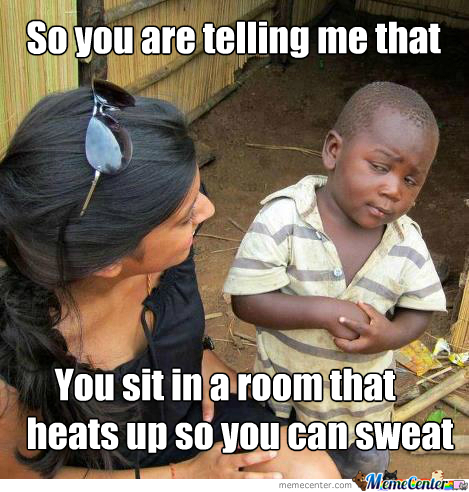 In fact, “sauna” is a Finnish word and one of the few that has spread into other languages. Speaking of birthplaces, long ago, most Finnish mothers gave birth to their babies in saunas. 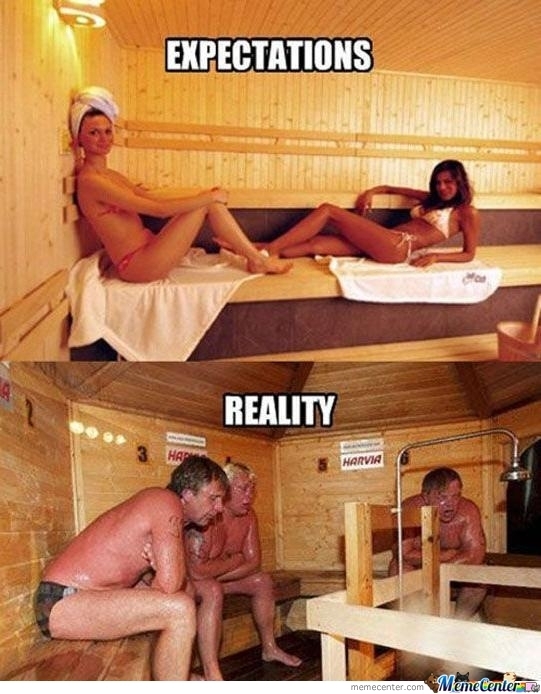 Can you imagine taking a girl back to your sauna for the first time and being able to say: “And that’s where I was born…” Talk about a mood killer! The sauna’s versatility has largely led to its popularity. A sauna can provide everything from a roof over your head, to a stove to cook food on, to a place to keep warm during the long winter months. Saturday is the traditional sauna day and most Finnish citizens try to get in a steam at least once each week. Saunas can be found outdoors along the country’s shoreline, in apartments, at corporate offices, and even in their Parliament and 1,400 meters deep at the Pyhäsalmi Mine. While in the sauna, some users may beat themselves with a leafy branch of a birch tree, which is said to relax the muscles. When the temperature gets too uncomfortable, these crazy Finns will jump in a pool or other body of water to cool down. Even wilder, in the winter, they will roll around in the snow or cut a hole in the ice and jump into the frigid water below. Here’s where I’m down with these nutty folk, though, as following their steam, it is customary to enjoy some sausage with beer to finish the experience. Then you can lather, rinse and repeat as many times as you want! 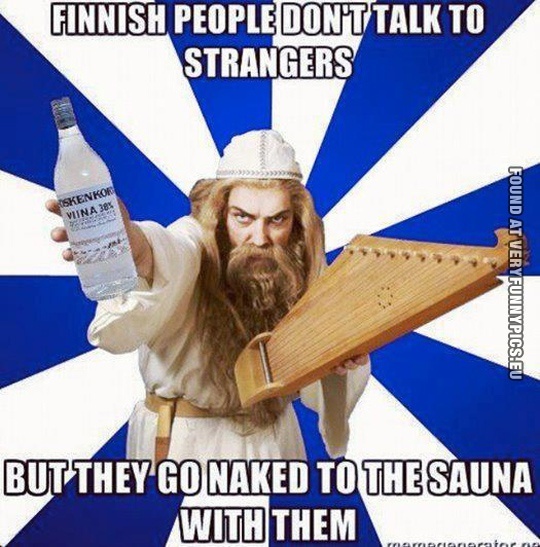 The sauna is a sacred place to many Finns and so it is a huge party foul to swear while inside. Controversial topics are also avoided as arguments in the sauna are frowned upon and conversation is generally of the relaxed variety. It should be noted that in Finnish folklore, a sauna elf lives in the structure and is its spirit. Men and women often sauna separately, although younger generations are more open to group sauna time (remember, everyone is supposed to be totally naked). Families use the sauna together, as well, but at a certain age, teenagers split from their parents. For Finnish business people, a sauna invitation is in the same vein as going to lunch or drinks. If a foreigner refuses an invite, this may be looked down on by the host. If staying with a Finn, the sauna might be warmed up in your honour, making it that much more difficult to pass up. The World Sauna Championships were held from 1999-2010 in Heinola, Finland, despite the Finnish Sauna Society (yes, this organization actually exists) strongly opposing the event, due to the health risk of being enclosed amongst hot temperatures for long periods of time. The competitors basically tried to sit in the sauna the longest and be the last to leave the structure without assistance. Finnish athletes (no, that can’t be the right word for this) dominated the event, which ceased operations after the 2010 championship, due to a Russian competitor dying from third-degree burns and a former five-time Finnish champion needing to be rushed to the hospital where he was put into a medically-induced coma for six weeks. There are different types of saunas commonly used throughout Finland, which differ depending on how it’s heated or the building it’s housed in. The heating options include: a smoke sauna, a wood stove sauna, and an electric stove sauna. Housing differences comprise everything from portable tents to saunas built into cars, buses, trailers, and even bicycles. There are companies that rent mobile saunas and there’s even an annual event for the phenomenon in Teuva, Finland. This must turn into the largest gathering of sweaty, naked people on earth, which has me thinking that it’s time for a refreshing drink. I don’t use Ma and Pa Sip’s sauna as often as I should. It helped in getting Mrs. Sip into the pool on cooler days, with the promise that she could retreat to the sauna when she got too cold. Manipulative, yes… but you would do it too if you ever saw Mrs. Sip in a bikini! This was a very nice drink that is as easy on the eyes as it is on the palate. 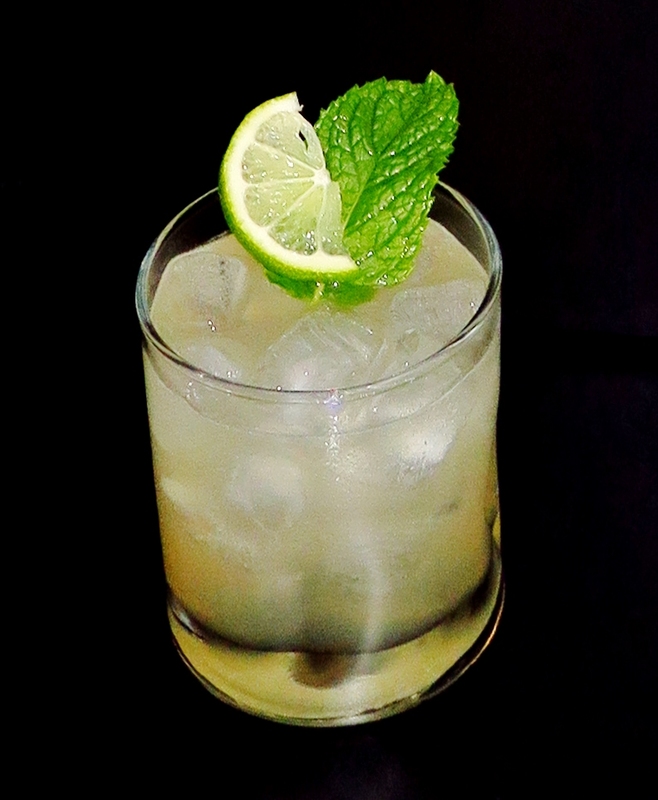 Ginger Ale has got to be one of the best mixers out there and it always works nicely with Lime Juice. I don’t think I’ve ever had it before with Vodka, usually putting it together with Rum or Whiskey. It works here just as well as with the other spirits! This entry was posted in Crazy & Classic Cocktails and tagged Arctic Circle, cocktail, Finland, Finlandia Vodka, Finnish Folklore, Finnish Parliament, Finnish Sauna Society, Ginger Ale, lime juice, Mint Leaves, Pyhäsalmi Mine, Sauna, Sauna Culture, World Sauna Championships by Daniel Wilson. Bookmark the permalink.